About "Becoming Adult, Becoming Christian"
Fowler is Charles Howard Chandler Professor of Theology and Human Development and Director of Emory University's Center for Ethics in Public Policy and the Professions. Introduction. Adult Development Theories And The Crisis Of Vocation. The Crisis In Vocational Ideals. Images Of Good Man/good Woman In Ferment. From "ideological Tepee" To Proteus: Continuity And Change. Adult Developmental Theorists As Philosophers And Gossips. Developmentalists As Philosophers And Gossips. Developmentalists As Philosophers And Gossips (e. Erikson). Toward Generative Adulthood (d. Levinson). Seasons And Wisdom (c. Gilligan). Two Paths To Resonsible Selfhood. Faith Development Theory And The Human Vocation. Taking Stock. Faith, A Focus For Research. Stages Of Faith And Human Becoming. Faith Development Theory And The Human Vocation. Adulthood, Vocation, And The Christian Story. The Christian Classic And Its Narrative Structure. Christian Faith And The Human Vocation. The Challenge Of Vocation. Vocation Vs. Destiny, Or Beyond Self-actualization. Christian Community And Adulthood. Self And Others: From Destiny To Vocation. Vocational Existence And Christian Community. The Christian Story, Passion, And Affections. Virtues And Vocation. 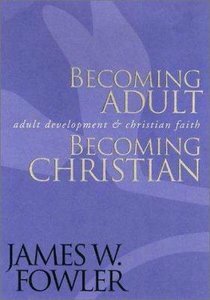 Becomging Adult, Becoming Christian. Studies In Vocation. Vocation And The Stories Of Our Lives. Development And Conversion. Becoming Adult, Becoming Christian. Acknowledgments. Index.